Modern genre fiction, that is science fiction and fantasy from the post Cold War era, is certainly entertaining, but not challenging — a meal replacement pill as compared to Haute cuisine. The authoritarian communist threat is done, and the public generally views space exploration as passé. As scifi authors, Huxley and Orwell were born at just the right time to write about “big” ideas. 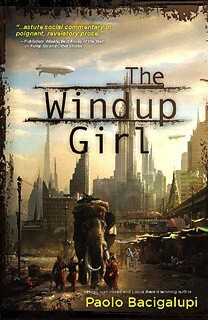 The Windup Girl’s biopunk setting of 23rd century Thailand broaches current topics such as GMO, seed banks, monocultures and disease, anti-globalism, corporatocracy and nationalism. In this post-hydrocarbon setting potential energy is generated by genetically engineered mammoths and stored in springs. The book is certainly engaging and filled with imaginative solutions to futuristic problems. But is it a classic? Extremely good storytelling and imaginative ideas aside, two factors determine if a piece of genre fiction will become a classic: 1) it is subversive in its challenge to current social norms; 2) it is prescient. Some examples would be Huxley’sBrave New World (written in 1931) and Orwell’s Nineteen Eighty-Four (published in 1949). Bacigalupi’s premise of a world destroyed by industrial farming and advances in genetic engineering might be particularly prescient — we will have to wait and see. However his futuristic contribution to the present debates over “Frankenfood” and globalization are certainly challenging, and follow the model of scifi as speculative social commentary. This book is certainly a potential classic, and Bacigalupi has restored my faith in modern scifi. I put this section at the end of this article simply because I do not think my issues with the book will impact your reading of it. Ignore the following if you like. One aspect of the writing that bothered me throughout the book was a sense of overpowering orientalism. I am not sure how much time Bacigalupi spent in Asia, but I felt his Asian characters had their “Asian-ness” turned up to eleven. The Japanese boss introduced near the end of the story is found clothed in a kimono in a tatami room adorned with “samurai” swords painting sumie. Wow. I was surprised he wasn’t described as short, buck-toothed with small round glasses and Nikon camera hanging around his neck. Another example: the character use of poetic simile. Even the lowest Thai street urchin has the poetic sense of a Bashō or a Li Bai. Bacigalupi romanticizes stereotypical Asian sensibilities of nature worship. Such a sensibility certainly does exist, and sprinkling it throughout the story subtly would have been very effective, but drenching the story as he does in this “special sauce” makes it hard to swallow. This ties in with a second criticism regarding how religion is depicted in the novel. Bacigalupi is careful to represent both sides of the globalization debate, GM food debate, and the AI debate, providing arguments both for and against. He does however take a solidly anti-corporatist stance. But he does not justify the power of Asian religion in the 23rd century (he does explain the western Grahamite resurgence, describing them as biotech reactionaries). Only the company men are atheists while nearly every Asian in the book has a tight relationship to their various gods, including New People (GM humanoids)! As someone who lived and travelled throughout Asia for most of my adult life, I would love to learn more of Bacigalupi’s experience there. How many years was he there? How well does he speak Thai? His other book Ship Breaker attests to his deep interest in South Asia. I would like to learn more about the man, and maybe I can through reading his other books.